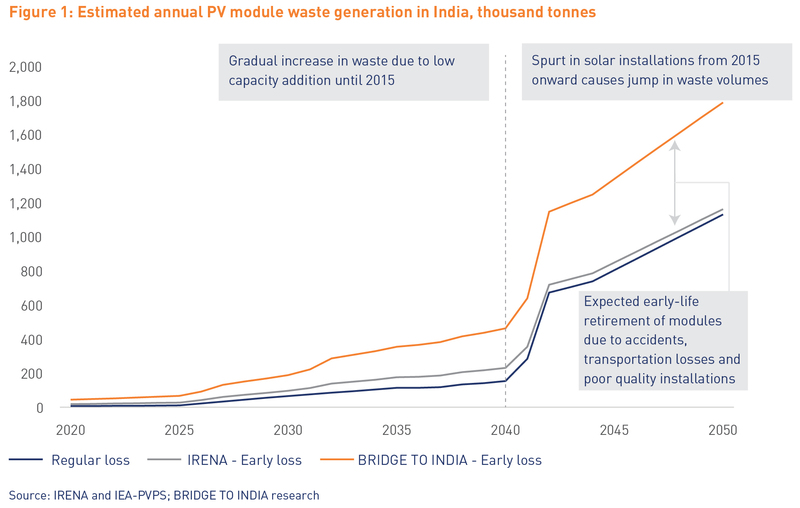 While the Indian solar sector continues to grow robustly – from a mere 3 GW in 2014 to over 28 GW by end 2018 – there is still no clarity on solar waste management and equipment recycling in the country. We estimate that solar module waste alone would grow to 1.8 million tonnes by 2050, equivalent to the annual e-waste volume generated at present. India is poorly positioned to handle growing PV waste as there is no requisite policy framework for operational infrastructure. It is imperative that policy makers and private stakeholders act proactively and in concert for long-term growth of the sector. Immediate efforts are required to formulate a robust regulatory framework for allocating responsibility and specifying standards for PV waste management. Our report estimates total solar waste volume over the next 32 years, looks at international technical and regulatory best practices and makes recommendations for the Indian market.